When it comes to residential demolition around Lake Norman, there is no business more trusted than Alden & Son. We provide an extensive list of client services to help support your project, including demolition, salvage and hauling. Whether you’re working with a private contractor or initiating a project on your own, we’re happy to work with you and your team to ensure the demolition process is handled accurately and safely. 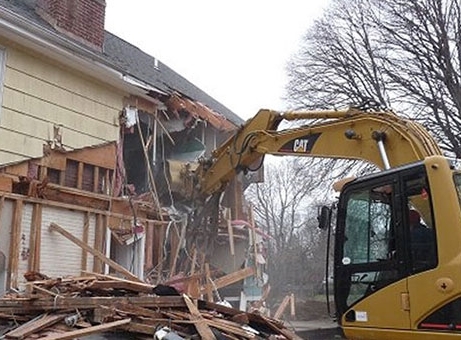 House demolition and tear downs: If you need to tear down all or part of your home before you can rebuild, turn to our experts for professional house demolition around Lake Norman. 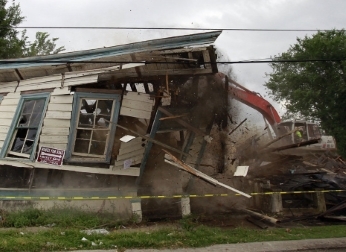 We will even help with cleaning up, hauling and sorting salvage after demolition is complete. Driveways: When a driveway is cracked, sunken or damaged beyond repair, it may be time to call in a specialist for demolition. Driveway demolition allows you to break up misshapen asphalt and gives you the chance to repave on even ground. Garages: Should your family decide to rebuild or remove your garage, our services can assist you with all of your demolition needs. Our licensed technicians can facilitate the demolition of your garage, handle clean up and sort through the wreckage to determine any recyclable parts. Pools: Tearing up a pool can be a complicated process, and is best left to professionals who specialize in residential demolition. 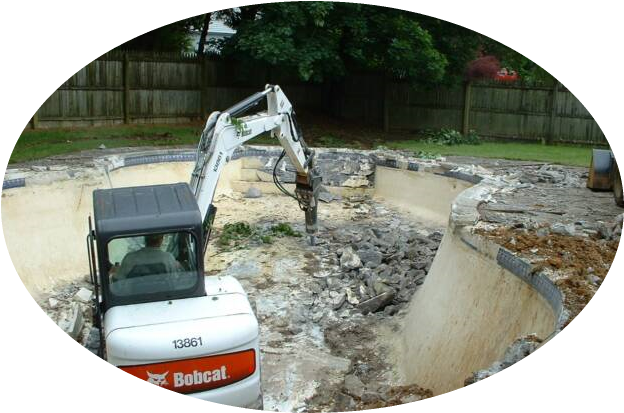 Our pool demolition services enable clients to renovate their backyards, and can be especially helpful for new homeowners or future sellers who are looking to improve the value of a home. Obtain a permit. You will most likely need a permit to tear down the house, so check with city and county officials. Sometimes homeowners do work without a permit, which is never advised, thinking nobody will notice. But a huge bulldozer in the yard, clawing away gigantic chunks of your house and slamming the debris into rubble, is going to draw attention. So get a permit if one is required. Check with the fire department and utility companies. You may not realize that gas, water, and electricity can't simply be turned off and ripped out. Utilities need to be properly disconnected and abandoned or terminated at the source. Your local fire department and utility companies might want to inspect and sign-off on this work first. Inspect for hazardous materials. Many older homes were constructed with materials that today are considered hazardous. Asbestos, for example, was commonly used in flooring, ceilings, wrapped around duct work and contained in siding. Asbestos abatement can cost an additional $2 to $3 per square foot to remove, according may experts. If you discover an old diesel tank underground, except to pay a surcharge. Call your mortgage lender. Unless your property is free and clear from all liens or encumbrances, your mortgage is secured to the structure as well as the land. Your lender has an interest in the building itself, so you cannot unilaterally destroy the lender's security without permission. If the lender's security is damaged, realize that your loan may contain an acceleration clause, which allows the lender to immediately demand payment in full. An alternative is to arrange for construction financing, which will carry a higher interest. Submit building plans for approval. Even if city building codes allow construction of certain structures, your community may prevent you from building the home you desire. If you don't want to find yourself sitting in the dirt on a vacant lot, drying tears with your architectural drawings, submit your plans to all the appropriate authorities beforehand.